Drama Centre London and the School of Theatre at Manchester Metropolitan University have topped a drama school satisfaction survey, with all students polled happy with their training. According to this year’s National Student Survey, the average student satisfaction at drama schools has increased from 86% in 2014 to 87% in 2015. This figure is also slightly higher than the national satisfaction average for higher and further education institutions, which is currently 86%. The survey, conducted by Higher Education Funding Council England, asks undergraduate students at 160 universities how happy they are with teaching, support and resources at their institution of study. 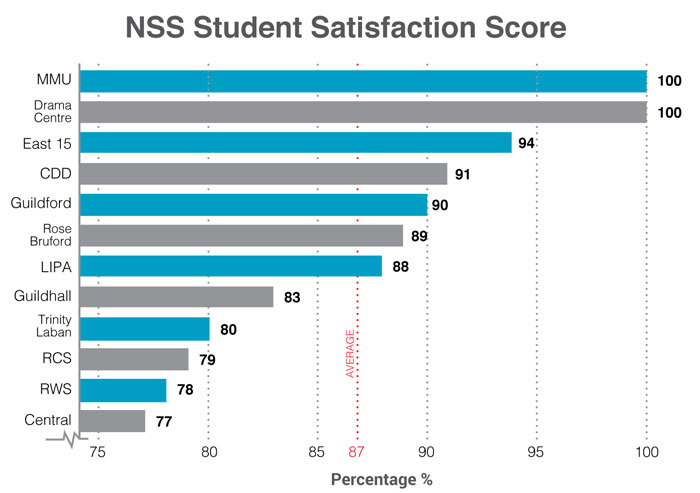 The scores represent the percentage of students who said they either agreed or mostly agreed with the statement ‘Overall, I am satisfied with the quality of my course’. The Conservatoire for Dance and Drama – which incorporates RADA, LAMDA and Bristol Old Vic Theatre School – came in fourth place for drama schools with a satisfaction score of 91%, up from 89% last year. However, seven drama schools saw a decline in student satisfaction, including Guildford School of Acting, which had a 100% score last year but slipped 10 percentage points to 90% this year. Royal Conservatoire of Scotland and Royal Welsh College of Music and Drama saw drops of 10% and 8% respectively. MMU was the most improved drama school, having boosted last year’s score of 83% to 100% this year. David Shirley, the programme leader for the university’s BA acting course, told The Stage: “Effective actor training involves a willingness on the part of students to be courageous and to take risks – something that can only be achieved in an atmosphere that is supportive and enabling. The Royal Central School of Speech and Drama scored the poorest student satisfaction out of all the drama schools surveyed at 77%, a 4% drop from its score last year. McNamara said the school’s upcoming £13 million expansion  aimed to address these concerns. “Our plans for a new building by 2017 will give us additional teaching and learning accommodation, rehearsal studios and performance spaces and enable us to house the activities of all of our students on our site at Swiss Cottage,” she added. A number of drama schools accredited by Drama UK – including Mountview, Arts Educational Schools and Italia Conti – are not eligible for the annual survey as they are not funded through HEFCE. Drama schools that are part of wider institutions such as MMU, DCL and East 15 have provided The Stage with isolated satisfaction figures for their acting courses, which are Drama UK-accredited. It is however notable that MMU and DCL have a smaller student intake at an undergraduate level than other schools listed by the survey. When asked by The Stage prior to publication, Birmingham School of Acting declined to publish its satisfaction score. However, it has since revealed a score of 85%. This article was updated on August 24.